Shuffleboard in both court and table format is a fun game for groups. 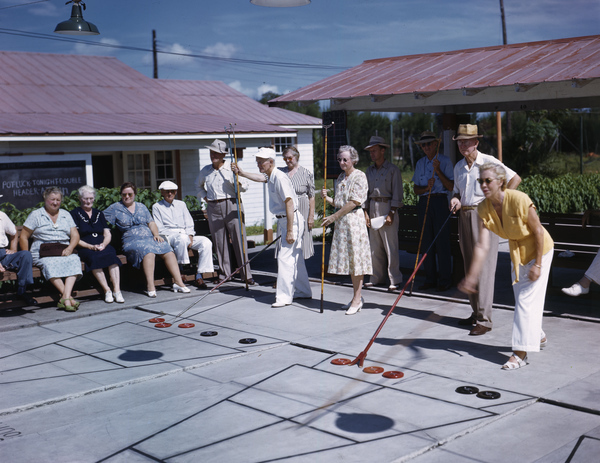 When you think about shuffleboard, you may be imagining a game your grandparents like to play in Florida. It's true, full court shuffleboard is a wonderful game to play for retired types and those with limited physical prowess. That said, court shuffleboard games require strategy and practice. There are both scoring zones and penalty zones, so your ability to keep it in the kitchen is imperative. The largest shuffleboard club in the world is located in St. Petersburg, FL. The club opened in 1924 and set the precedent in town for the best place to have a slipped disc. The Royal Palms Shuffleboard Club has extracted the tradition of court shuffleboard found in Florida, added a heavy dose of pizazz, and brought it to the people of Brooklyn and Chicago (coming late 2017/early 2018). The original Brooklyn shuffle outpost has 10 courts within a 17,000 square foot shuffleboard oasis equipped with two bars, food trucks, a boozy slushy machine, competitive leagues for all skill levels, and an even more competitive #beakoftheweek contest (see more on that on Instagram). The Chicago Royal Palms will be opening soon in the Bucktown neighborhood by the 606 Bloomingdale trail and we're expecting the club to quickly join the Chicago bucket list. Learning how to play table shuffleboard is fairly simple and is ideal for one on one or doubles (but can also be played in teams, especially in league format). Table shuffleboard is a popular bar game around town and you can probably find a table or league within striking distance. Table shuffleboard is similar to court shuffleboard in that two teams are hurling spherical discs (aka biscuits in both cases) toward regions that score point. However, court shuffleboard requires a stick and table shuffleboard pucks are launched by hand.